Neuroscientists are getting excited about non-invasive procedures to tune the brain’s natural oscillations. In March 2015, Li-Huei Tsai set up a tiny disco for some of the mice in her laboratory. For an hour each day, she placed them in a box lit only by a flickering strobe. The mice — which had been engineered to produce plaques of the peptide amyloid-β in the brain, a hallmark of Alzheimer’s disease — crawled about curiously. When Tsai later dissected them, those that had been to the mini dance parties had significantly lower levels of plaque than mice that had spent the same time in the dark1. Tsai, a neuroscientist at Massachusetts Institute of Technology (MIT) in Cambridge, says she checked the result; then checked it again. “For the longest time, I didn’t believe it,” she says. Her team had managed to clear amyloid from part of the brain with a flickering light. The strobe was tuned to 40 hertz and was designed to manipulate the rodents’ brainwaves, triggering a host of biological effects that eliminated the plaque-forming proteins. Although promising findings in mouse models of Alzheimer’s disease have been notoriously difficult to replicate in humans, the experiment offered some tantalizing possibilities. The result was so mind-boggling and so robust, it took a while for the idea to sink in, but we knew we needed to work out a way of trying out the same thing in humans, Tsai says. Scientists identified the waves of electrical activity that constantly ripple through the brain almost 100 years ago, but they have struggled to assign these oscillations a definitive role in behaviour or brain function. Studies have strongly linked brainwaves to memory consolidation during sleep, and implicated them in processing sensory inputs and even coordinating consciousness. Yet not everyone is convinced that brainwaves are all that meaningful. “Right now we really don’t know what they do,” says Michael Shadlen, a neuroscientist at Columbia University in New York City. Now, a growing body of evidence, including Tsai’s findings, hint at a meaningful connection to neurological disorders such as Alzheimer’s and Parkinson’s diseases. The work offers the possibility of forestalling or even reversing the damage caused by such conditions without using a drug. More than two dozen clinical trials are aiming to modulate brainwaves in some way — some with flickering lights or rhythmic sounds, but most through the direct application of electrical currents to the brain or scalp. They aim to treat everything from insomnia to schizophrenia and premenstrual dysphoric disorder. Brainwaves were first noticed by German psychiatrist Hans Berger. In 1929, he published a paper2 describing the repeating waves of current he observed when he placed electrodes on people’s scalps. It was the world’s first electroencephalogram (EEG) recording — but nobody took much notice. Berger was a controversial figure who had spent much of his career trying to identify the physiological basis of psychic phenomena. It was only after his colleagues began to confirm the results several years later that Berger’s invention was recognized as a window into brain activity. Neurons communicate using electrical impulses created by the flow of ions into and out of each cell. Although a single firing neuron cannot be picked up through the electrodes of an EEG, when a group of neurons fires again and again in synchrony, it shows up as oscillating electrical ripples that sweep through the brain. Those of the highest frequency are gamma waves, which range from 25 to 140 hertz. People often show a lot of this kind of activity when they are at peak concentration. At the other end of the scale are delta waves, which have the lowest frequency — around 0.5 to 4 hertz. These tend to occur in deep sleep (see ‘Rhythms of the mind’). At any point in time, one type of brainwave tends to dominate, although other bands are always present to some extent. Scientists have long wondered what purpose, if any, this hum of activity serves, and some clues have emerged over the past three decades. For instance, in 1994, discoveries in mice indicated that the distinct patterns of oscillatory activity during sleep mirrored those during a previous learning exercise3. Scientists suggested that these waves could be helping to solidify memories. Brainwaves also seem to influence conscious perception. Randolph Helfrich at the University of California, Berkeley, and his colleagues devised a way to enhance or reduce gamma oscillations of around 40 hertz using a non-invasive technique called transcranial alternating current stimulation (tACS). By tweaking these oscillations, they were able to influence whether a person perceived a video of moving dots as travelling vertically or horizontally4. But these oscillations can become disrupted in certain disorders. In Parkinson’s disease, for example, the brain generally starts to show an increase in beta waves in the motor regions as body movement becomes impaired. 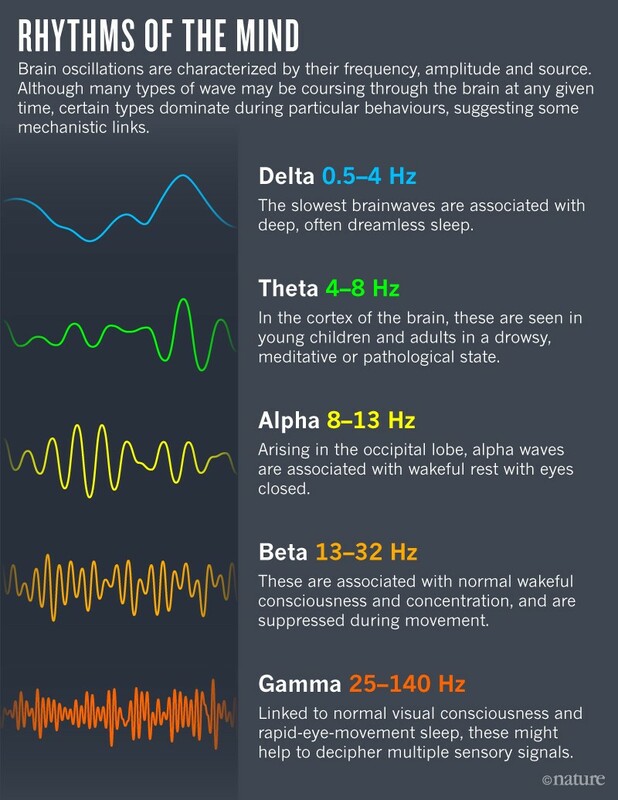 In a healthy brain, beta waves are suppressed just before a body movement. But in Parkinson’s disease, neurons seem to get stuck in a synchronized pattern of activity. This leads to rigidity and movement difficulties. Peter Brown, who studies Parkinson’s disease at the University of Oxford, UK, says that current treatments for the symptoms of the disease — deep-brain stimulation and the drug levodopa — might work by reducing beta waves. People with Alzheimer’s disease show a reduction in gamma oscillations5. So Tsai and others wondered whether gamma-wave activity could be restored, and whether this would have any effect on the disease. They started by using optogenetics, in which brain cells are engineered to respond directly to a flash of light. In 2009, Tsai’s team, in collaboration with Christopher Moore, also at MIT at the time, demonstrated for the first time that it is possible to use the technique to drive gamma oscillations in a specific part of the mouse brain6. Tsai and her colleagues subsequently found that tinkering with the oscillations sets in motion a host of biological events. It initiates changes in gene expression that cause microglia — immune cells in the brain — to change shape1. The cells essentially go into scavenger mode, enabling them to better dispose of harmful clutter in the brain, such as amyloid-β. Koroshetz says that the link to neuroimmunity is new and striking. “The role of immune cells like microglia in the brain is incredibly important and poorly understood, and is one of the hottest areas for research now,” he says. If the technique was to have any therapeutic relevance, however, Tsai and her colleagues had to find a less-invasive way of manipulating brainwaves. Flashing lights at specific frequencies has been shown to influence oscillations in some parts of the brain, so the researchers turned to strobe lights. They started by exposing young mice with a propensity for amyloid build-up to flickering LED lights for one hour. This created a drop in free-floating amyloid, but it was temporary, lasting less than 24 hours, and restricted to the visual cortex. To achieve a longer-lasting effect on animals with amyloid plaques, they repeated the experiment for an hour a day over the course of a week, this time using older mice in which plaques had begun to form. Twenty-four hours after the end of the experiment, these animals showed a 67% reduction in plaque in the visual cortex compared with controls. The team also found that the technique reduced tau protein, another hallmark of Alzheimer’s disease. Alzheimer’s plaques tend to have their earliest negative impacts on the hippocampus, however, not the visual cortex. To elicit oscillations where they are needed, Tsai and her colleagues are investigating other techniques. Playing rodents a 40-hertz noise, for example, seems to cause a decrease in amyloid in the hippocampus — perhaps because the hippo-campus sits closer to the auditory cortex than to the visual cortex. Tsai and her colleague Ed Boyden, a neuro-scientist at MIT, have now formed a company, Cognito Therapeutics in Cambridge, to test similar treatments in humans. Last year, they started a safety trial, which involves testing a flickering light device, worn like a pair of glasses, on 12 people with Alzheimer’s. Caveats abound. The mouse model of Alzheimer’s disease is not a perfect reflection of the disorder, and many therapies that have shown promise in rodents have failed in humans. “I used to tell people — if you’re going to get Alzheimer’s, first become a mouse,” says Thomas Insel, a neuroscientist and psychiatrist who led the US National Institute of Mental Health in Bethesda, Maryland, from 2002 until 2015. His team has begun an early clinical trial in which ten people with Alzheimer’s disease receive tACS for one hour daily for two weeks. A second trial, in collaboration with Boyden and Tsai, will look for signals of activated microglia and levels of tau protein. Results are expected from both trials by the end of the year. Knight says that Tsai’s animal studies clearly show that oscillations have an effect on cellular metabolism — but whether the same effect will be seen in humans is another matter. “In the end, it’s data that will win out,” he says. Nevertheless, there is clearly a growing excitement around treating neurological diseases using neuromodulation, rather than pharma-ceuticals. “There’s pretty good evidence that by changing neural-circuit activity we can get improvements in Parkinson’s, chronic pain, obsessive–compulsive disorder and depression,” says Insel. This is important, he says, because so far, pharmaceutical treatments for neurological disease have suffered from a lack of specificity. Koroshetz adds that funding institutes are eager for treatments that are innovative, non-invasive and quickly translatable to people. Since publishing their mouse paper, Boyden says, he has had a deluge of requests from researchers wanting to use the same technique to treat other conditions. But there are a lot of details to work out. “We need to figure out what is the most effective, non-invasive way of manipulating oscillations in different parts of the brain,” he says. “Perhaps it is using light, but maybe it’s a smart pillow or a headband that could target these oscillations using electricity or sound.” One of the simplest methods that scientists have found is neurofeedback, which has shown some success in treating a range of conditions, including anxiety, depression and attention-deficit hyperactivity disorder. People who use this technique are taught to control their brainwaves by measuring them with an EEG and getting feedback in the form of visual or audio cues. 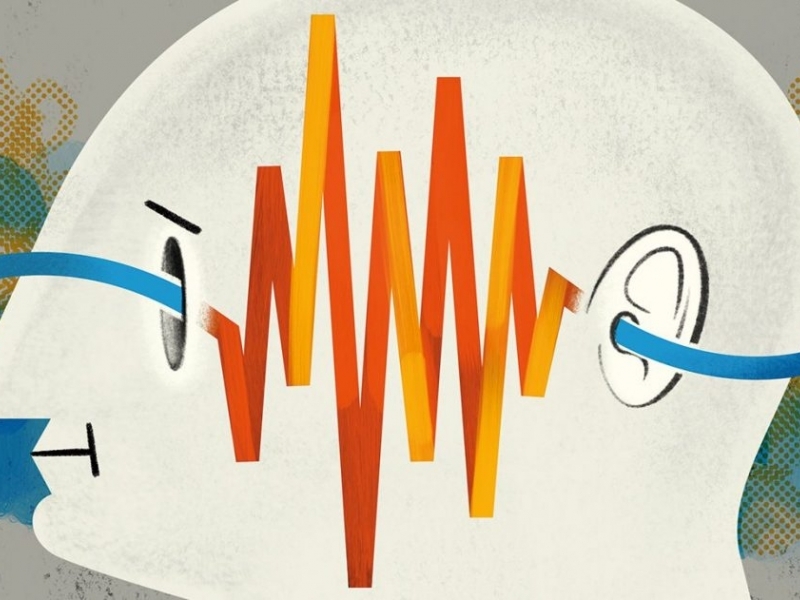 Phyllis Zee, a neurologist at Northwestern University in Chicago, Illinois, and her colleagues delivered pulses of ‘pink noise’ — audio frequencies that together sound a bit like a waterfall — to healthy older adults while they slept. They were particularly interested in eliciting the delta oscillations that characterize deep sleep. This aspect of sleep decreases with age, and is associated with a decreased ability to consolidate memories. So far, her team has found that stimulation increased the amplitude of the slow waves, and was associated with a 25–30% improvement in recall of word pairs learnt the night before, compared with a fake treatment7. Her team is midway through a clinical trial to see whether longer-term acoustic stimulation might help people with mild cognitive impairment. In addition to potentially leading to treatments, these studies could break open the field of neural oscillations in general, helping to link them more firmly to behaviour and how the brain works as a whole. Whatever their role, Tsai mostly wants to discipline brainwaves and harness them against disease. Cognito Therapeutics has just received approval for a second, larger trial, which will look at whether the therapy has any effect on Alzheimer’s disease symptoms. Meanwhile, Tsai’s team is focusing on understanding more about the downstream biological effects and how to better target the hippocampus with non-invasive technologies.